LOS ANGELES (Feb. 6, 2019): WBA Super Featherweight World Champion Alberto "Explosivo" Machado (21-0, 17 KOs) of San Juan, Puerto Rico and 130-pound contender Andrew "El Chango" Cancio (19-4-2, 14 KOs) of Blythe, Calif. hosted their final press conference at the Golden Boy Promotions headquarters in Los Angeles ahead of their 12-round battle. The event will take place on Saturday, Feb. 9, 2019 at Fantasy Springs Resort Casino in Indio, Calif. and will be streamed live on DAZN - which is just $9.99 per month after a one-month free trial. "I fulfilled my dreams of having a world title fight on HBO. This fight will also be something great for Puerto Rico as I headline on this new platform, DAZN. I want everyone in Puerto Rico to know that I will be ready to defend my title. We've had an extremely successful camp in Los Angeles. This is my fifth camp here. I want to thank my manager Juan De Leon and Freddie Roach for helping me become a better fighter and person. 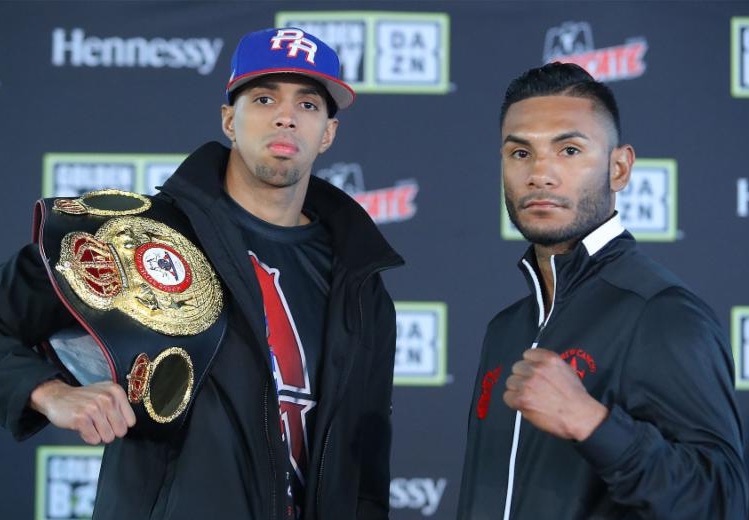 Andrew Cancio is a strong and hungry fighter because he wants to become a world champion. But we trained hard to make a successful defense this Saturday." "I want to thank Golden Boy Promotions for this opportunity. I want to thank the champion as well for this opportunity to fight for a world title. I'm going to come in well prepared to give an exciting fight for everyone on Saturday night. I know it will be tough, but Im well prepared for this fight. It's been a long road to get here, but we're here. We're going to do everything in our power to win on Saturday night." "I'm very happy to return again to the ring. We are highly motivated. Instead of just talking with words, I'll do my talking in the ring. They say we are over confident, but we are going in the ring intelligently. He's a strong fighter. He has some technical deficiencies, but that's his style. We'll be careful in there, but we're looking for the knockout. Though would like to unify titles by the end of the year, I'm 100% focused on the fight I have ahead of me." "I want to thank God because I'm here because of him. I want to thank Golden Boy Promotions. I'm waiting for February 9 to give the best of me. I know it's going to be a war. Rey Vargas has said that I must prepare for this fight psychological because I will walk away with a loss. I'm here to tell him to not get too confident because things can change. Thank you all, and I hope you are all well." "This is my first fight at 130 pounds, so I know it's going to be a big step up. I know that the power will be different, and the opponents will be stronger. I'm going to have to adapt in there, though I feel I was a big 126-pounder anyway. I'm ready to showcase and demonstrate that I'm going to be threat at 130 pounds. Charles [Huerta] is a dangerous opponent and I know it will be a big step up and a hard fight, but I'm ready. I'm going to be a major threat in the 130-pound weight class." "I want to thank everyone for coming out today. I want to thank Joseph Diaz, Jr. and his camp. I want to thank Golden Boy Promotions for giving me this opportunity after being off for so long. I had two injuries, but I'm healthy. We've been training strong at the gym and we're ready to go. Come Saturday, you will see the same Charles Huerta who leaves everything in the ring and gives a great show." Machado vs. Cancio is a 12-round fight for the WBA Super Featherweight World Title presented by Golden Boy Promotions and Miguel Cotto Promotions. 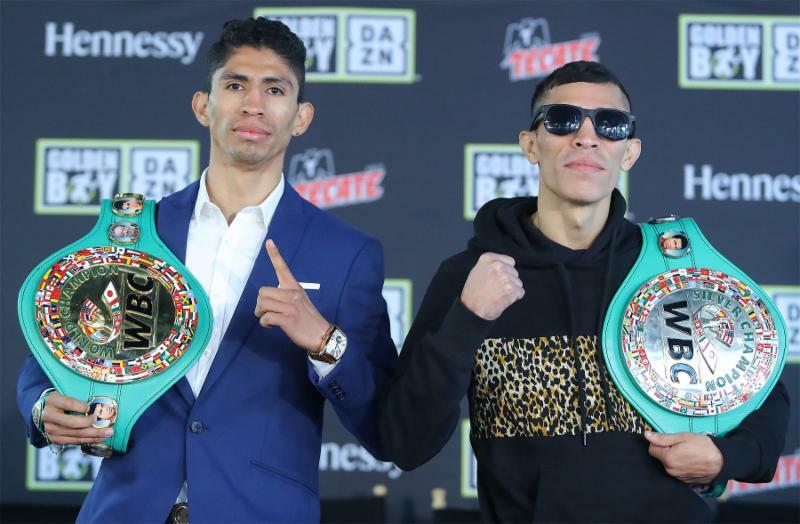 Vargas vs. Manzanilla is a 12-round battle for the WBC Super Bantamweight World Championship presented by Golden Boy Promotions in association with Promociones del Pueblo. The event is sponsored by Tecate, "THE OFFICIAL BEER OF BOXING," and Hennessy "Never Stop. Never Settle." The event will take place Saturday, Feb. 9, 2019 at Fantasy Springs Resort Casino and will be streamed live on DAZN. at www.facebook.com/GoldenBoyBoxing and https://www.facebook.com/DAZNUSA/. Follow on Instagram @GoldenBoyBoxing and @DAZN_USA. Follow the conversation using #MachadoCancio and #VargasManzanilla.